Text: The most widespread change in the general recreational life for women is shown by the increase of attendance at cinemas. Only a few years ago marked the beginning of cinema privileges for women in the Moslem East. Official approval of the cinema was given to women in Iran in 1928 by the removal of police restrictions. Special days were set aside when they could attend the cinema, the popularity of which was evident at the end of the performance from the steady stream of black chaddur figures leaving. A most remarkable performance for a mixed audience was given in Teheran in November 1928, when for the first time an unveiled Moslem woman sang in evening dress before a public audience. Seats were sold out several days in advance. Police were stationed in the aisles to avoid any possible trouble. A large detachment of police was detailed to the environs of the cinema, a precaution which showed the unusual significance of the occasion. It was one of the great events of the winter, widely talked about all over Iran. Cinemas in Iran still have a woman’s section, but women sit also in the mixed section, and enter veiled or unveiled. Even in a conservative centre such as Meshed women may attend the same cinema with men. An Iranian liberal newspaper made the interesting comment that having women sit with men at the cinema reduces the number of scenes in the streets and tends toward a higher moral tone. The opponents would of course challenge that statement. attending the cinema in 1930 when a large outdoor cinema was turned over to them once a week. The rule “For women only” was strictly observed; not even boys over twelve years were admitted. Crowds of women flocked to this popular weekly dissipation, almost as interested in seeing each other as in seeing the film, which, however, on the occasion of my visit was one of absorbing interest for the women of Damascus — the story of Saladin and the Crusades. Their keen reaction to the picture and enthusiasm over Saladin’s exploits gave one a different idea of the Crusades from the usual Western point of view. The women in Amman Trans-jordan six years ago attended their first film, entering veiled but sitting on the front row unveiled. Cinema attendances of women in Cairo in now a commonplace. Women go unveiled with men or veiled alone, unveiling during the performance; they sit in boxes or with the audience, as they choose. For the most part the cinema has not attracted the Moslem women of the lower class in Beirut or elsewhere as much as it has the upper class, since change in recreation, as in unveiling, begins at the top and works down. A woman in Beirut of this lower class whom I asked whether she ever attended a cinema, gave me an answer which seems typical of her social level. “We know the cinema by name, but have never seen one.” But the different grades of cinemas and cheaper prices are beginning to make their appeal to this class also. Moreover the production of films portraying Eastern life in the language of the East and produced by Eastern players is bringing the cinema more into the life of the uneducated women, to whom the unfamiliar Western scene makes less appeal than to those who have had some Western education. In Turkey since the first Turkish film with Turkish women performers was produced only a few years ago, the Turkish production has steadily increased and doubtless the appeal of the cinema has accordingly widened. 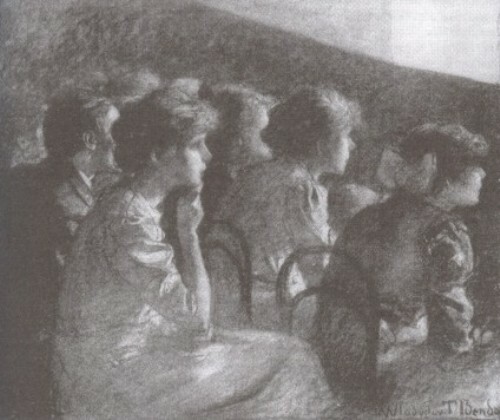 The unrestricted cinema attendance of Turkish women, since the special harem days were discontinued early in the new regime, is only one of the many indications of the naturalness of everyday life in Turkey to-day. Travel, bobbed hair, photographs, sports, recreation, going to the cinema, these many precious stages of advance for the still veiled or hesitantly unveiling woman elsewhere in the Moslem world, have all become for the Turkish woman merely a matter of personal choice. One is impressed to-day with the lack of all reference in the Press or in private conversation to these details of freedom, which are regarded to-day as a normal part of life. The idea of freedom of women has been so completely accepted that distinctions between men and women are now as little emphasized as they would be in the Western world. It is indeed difficult to realize that the grandfathers of the present free young Turkish girls might have paid the price of this freedom by exile or death. For to-day Turkish girls play tennis, dance, dine out if invited, swim, ride horseback, play bridge, patronize the beauty parlour, frequent the movies, travel if they can afford it — work, study and play just as girls do in France or America. There is of course at the present time between the life of Istanbul or Ankara and parts of Asia Minor not only a difference of degree, but also of the kind of social life. But there are no artificially imposed social conventions of the veil and eventually Istanbul or Ankara will differ from Konia or Sivas in much the same way as the life in New York or Washington differs from that of cities or towns in the south or middle west. Comments: Ruth Frances Woodsmall (1883-1963) was an American schoolteacher and author, who worked for the Young Women’s Christian Association, the Allied High Commission for Occupied Germany (where she was Chief of the Women’s Affairs Section), and UNESCO, reporting on women’s affairs. In 1928 she obtained a fellowship from the Rockefeller Foundation to investigate the changing status of Muslim women in the Middle East, which resulted in her influential book Moslem Women Enter a New World and other studies. This entry was posted in 1920s, 1930s, Egypt, Iran, Iraq, Lebanon, Syria, Transjordan, Travel writing, Turkey and tagged Amman, Audiences, Baghdad, Beirut, Cairo, Cine-variety, Cinemas, Damascus, Matinees, Ruth Frances Woodsmall, Teheran, Women. Bookmark the permalink.